How smart is your cyber security? 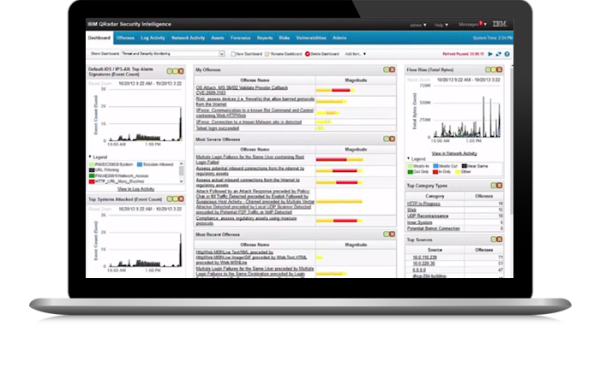 Detect and defend against network security threats with QRadar Sense Analytics. A single architecture for analyzing log events, netflows, network packets, vulnerabilities, user and asset data. Real-time correlation employing Sense Analytics to identify high-risk threats, attacks and security breaches. Prioritization of high-priority incidents among billions of daily data points received. Proactive analysis of existing risks due to device configurational issues and known vulnerabilities. Automated regulatory compliance with data collection, correlation and reporting capabilities. IBM QRadar aggregates security logs and network flows, and uses its Sense Analytics Engine to help identify advanced threats. Using behavioral-based analytics, it detects anomalies and suspicious activities, performs event aggregation and correlation, assesses severity, and provides security analysts with a manageable list of prioritized offenses requiring investigation. and incident response for rapid insider threat resolution. COBIT, SOX, GLBA, NERC, FISMA, PCI, HIPAA, UK GCSx and more. Salesforce.com, Google Cloud Identity & Access Management, and more. QRadar can also help secure infrastructures whether they are deployed on premises, in the cloud, or based on a hybrid model. help organizations develop corrective action plans. Safeguard critical data wherever it resides with IBM Guardium. IBM Security Guardium is a comprehensive data protection solution that provides a full range of data security capabilities, from compliance support to dynamic data masking. The solution helps secure your sensitive data across a full range of environments–including databases, big data platforms, cloud deployments, file systems and more. Guardium provides automated analysis to quickly uncover internal and external risks to sensitive data. The solution also easily adapts to changes in your IT environment, whether that includes adding new users, requiring more scalability or adding new technologies. intruders and hackers to gain access to sensitive data. IBM® Security® Guardium® Activity Monitor for Files prevents unauthorized data access, alerts on changes or leaks to help ensure data integrity, automates compliance controls and protects against internal and external threats. Continuous monitoring and real time security policies protect unstructured data across the enterprise without changes to file systems or applications or performance impact. It provides insight into your document and file contents, and usage patterns. IBM Security Guardium Activity Monitor for Files lets you discover, track, and control access to sensitive files on either local or networked file systems. IBM Security Guardium Activity Monitor for Files can help you meet compliance obligations and reduce the risks of major data breaches. IBM Security Guardium for Applications can protect sensitive or confidential data exposed in a web application, without requiring changes to the application itself. The software uses advanced dynamic data masking technology to mask sensitive information. It helps protect information from unauthorized users in accordance with your organization’s compliance mandates or security policies. IBM® Security Guardium Express Activity Monitor for Databases enables you to analyze, protect and adapt to support enterprise-level data activity monitoring that addresses compliance requirements for data access mandates. The preconfigured software offers automatic discovery and classification of sensitive data, real-time activity monitoring, provides centralized compliance for database environments, and delivers automated compliance workflow and activity reporting. Guardium Express Activity Monitory for Databases supports data activity monitoring (DAM) for distributed database repositories. It provides a non-intrusive, transparent and secure way to continuously monitor database activity, trigger pre-set real-time alerts on suspicious activities, and generate detailed audit logs for compliance reporting.